1. 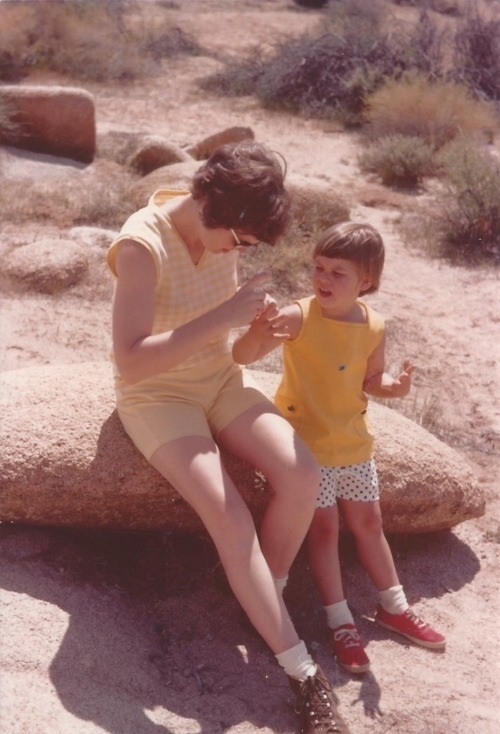 When I was three, on a Joshua Tree camping trip, my mom told me not to touch the cacti. Twenty minutes later, she was using Swiss Army Knife tweezers to take out hundreds of hair-like spines from my fingertips. 2. The first book I learned to read was stolen property. I showed my teacher how well I could read and she asked me, "Is this your book, Lorrie?" "Oh, yes, Miss Valentine." She pointed to a stamp on the inside cover. "Lorrie, can you read this?" "No." "Let me help you. PROPERTY OF HACIENDA ELEMENTARY SCHOOL." Uh-oh. 3. I quit law school to become a teacher. God said it was my calling. I decided to pay attention and do as I was told. Quit for the win. 4. One time, when I got up from a nap, I saw my mom, grandma, and great grandma standing at the kitchen sink. Shoulder to shoulder. Laughing. Talking. Eating oranges. Juice dripping from their fingers. "Remember this," I whispered to my 6 year-old self. 6. When I was in 8th grade, I read Gone with the Wind in three days on a family road trip to Canada. My dad was furious because he’d driven a long way to see those mountains and Rhett and Scarlett’s story was the only thing getting my attention. 7. While skiing in Mammoth during high school, I did a perfect front flip in front of cool dudes who started cheering when I stuck a perfect upright landing. Truthfully, it was the unintentional result of reckless skiing. Gravity and speed worked in my favor. Dad saw it. Chewed me out in front of cool dudes. Moment of glory gone. 8. When I was in my early 30’s and hopelessly single, my brother gave me advice that led me to the love of my life. "Lorrie, I try to get rejected at least once a week. It means I put myself out there. Keep your eye on the prize, Lorrie. It only takes one yes.” He was right. 9. Just before our daughter turned 13, we rafted down the Colorado River. I’d been waiting for her to be strong enough to hold on for dear life when we came to the river’s big rapids. Every night we did a bucket brigade to unload gear for setting up camp. All the hulking young men usually led the line, but my petite baby wanted to be in the thick of it. A couple times I nudged her and said, “Let some of the guys go in front of you.” She rolled her eyes with perfect preteen panache and kept tossing heavy gear bags like they were filled with feathers and ping pong balls. I love my strong girl. 10. During my first year of teaching, I had a 7th grade student who said, "I hate writing. You can't make me write." Well, I like a good challenge. By the end of the year, he was reading pieces aloud, with voice and authority that kept classmates listening beyond the dismissal bell. By the end of the year, he was a poet, using words to make sense of a life that had already thrown him wild curves. I think of that boy often, and wonder if he knows he was my favorite English teacher. Ever.